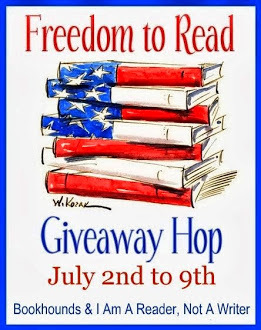 Today, you can enter to win your choice of ebook from Amazon, granted that it doesn't cost me body parts or firstborn children. If you really don't want an ebook, I'll totally spring for you a paperback copy of whatever. The same basic rules apply. Live somewhere that can receive ebooks from Amazon. Following is NOT required, but it is always appreciated. Your options are on my sidebar, but I will tell you that I would really love it if you followed me via Bloglovin'. Thanks for the easy entries! =) I'm a new follower! Thanks for this amazing hop! Happy 4th!! Happy birthday USA!